Joseph Stella (1877–1946), Brooklyn Bridge (1919-20), oil on canvas, 215.3 × 194.6 cm, Yale University Art Gallery, New Haven, CT. Wikimedia Commons. Following his return to New York City in late 1912, Joseph Stella (1877–1946) had radically changed his style and motifs. 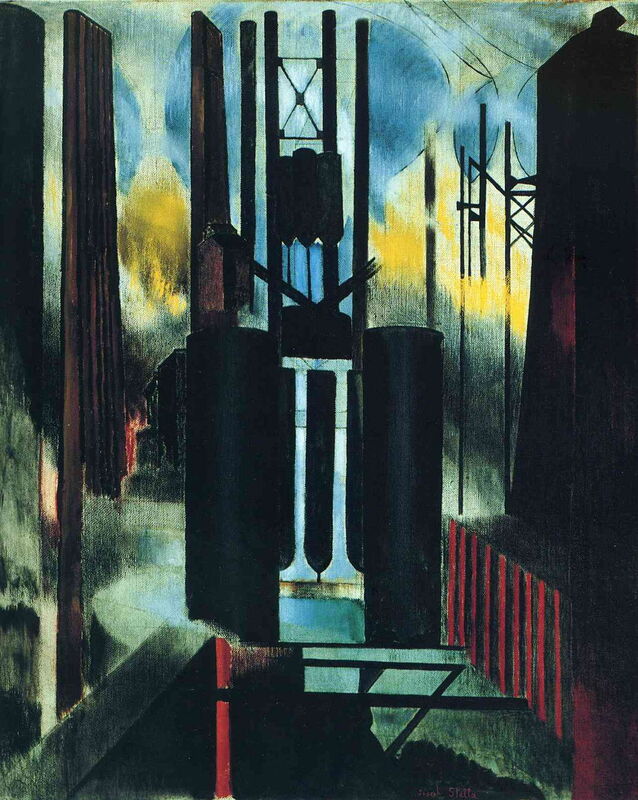 Late in the First World War, he had concentrated on industrial settings after initiating American Futurism in 1913. 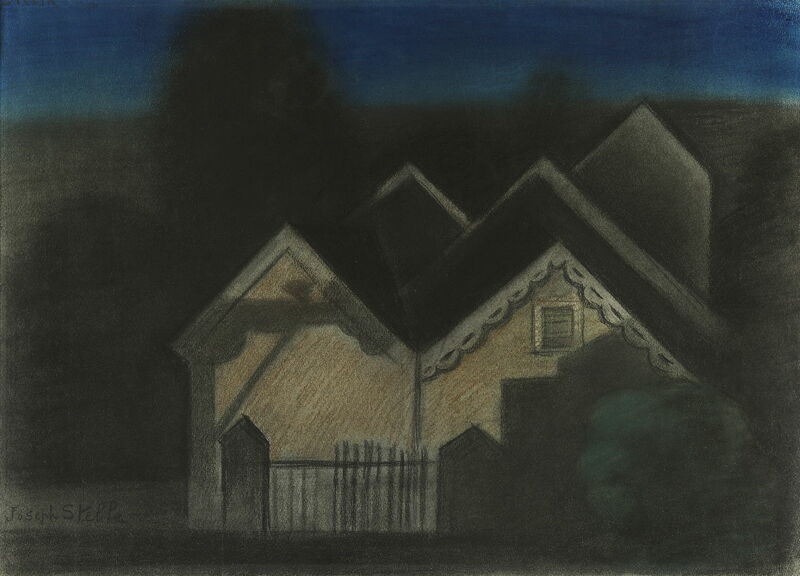 Joseph Stella (1877–1946), Nocturne II (c 1919), pastel on paper, 43.2 x 61 cm, Private collection. Wikimedia Commons. Another pastel, Nocturne II from about 1919, starts to move away from smoky factories, but remains dark and quietly sinister. 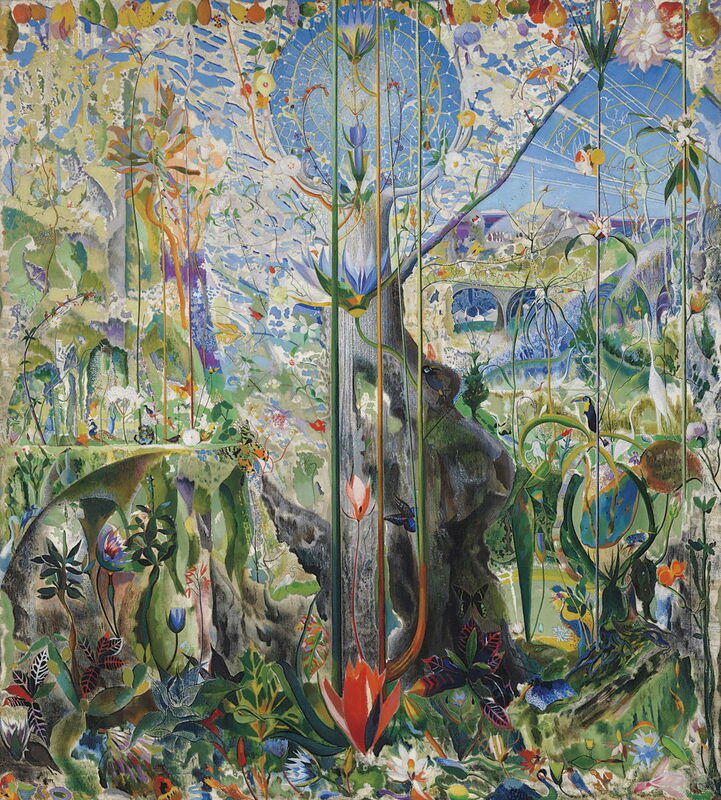 Joseph Stella (1877–1946), Tree of My Life (1919), oil on canvas, 213.4 x 193 cm, location not known. Wikimedia Commons. But the same year, he painted this large almost Surrealist fantasy, Tree of My Life, which appears to have been influenced by the extraordinary paintings of Hieronymus Bosch. It is filled with exotic plants and birds, and passages are densely patterned, as shown in the detail below. This painting was sold at auction late last year for nearly $6 million. 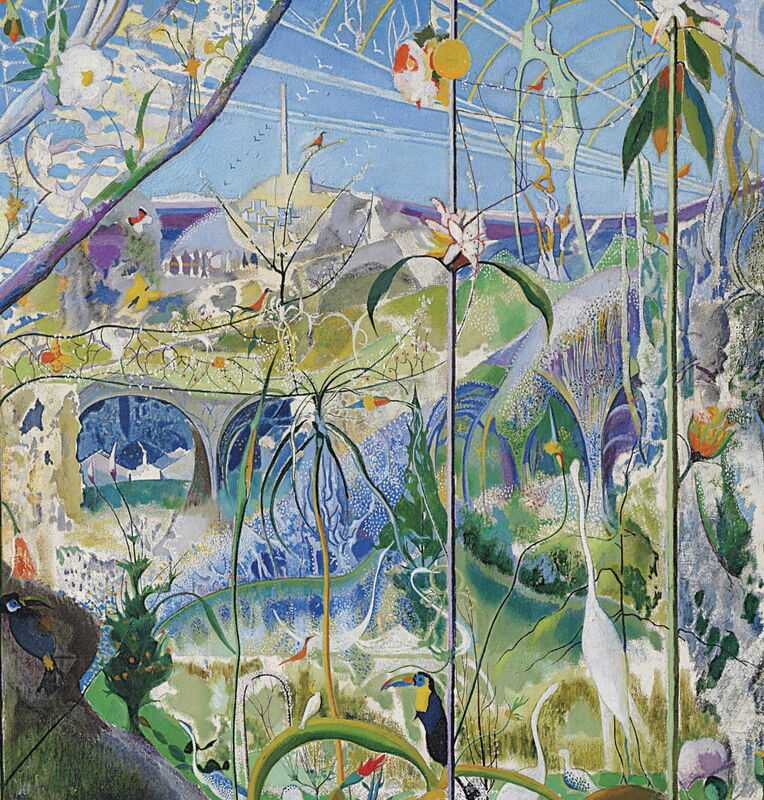 Joseph Stella (1877–1946), Tree of My Life (detail) (1919), oil on canvas, 213.4 x 193 cm, location not known. Wikimedia Commons. Stella’s eclecticism knew no bounds. 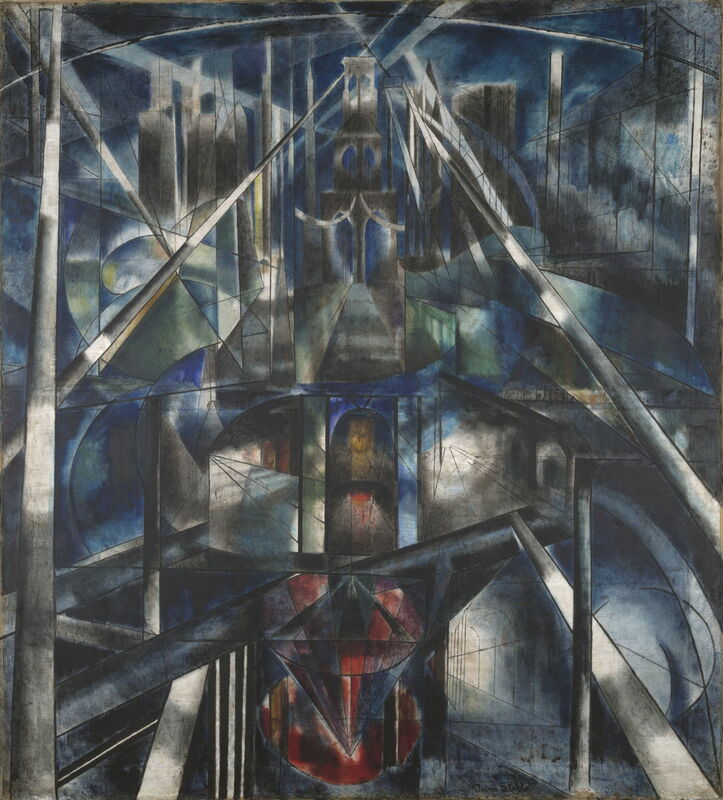 After that, he painted probably his best-known work, this Cubist geometric analysis of Brooklyn Bridge (1919-20). Joseph Stella (1877–1946), Factories (c 1920-21), oil on burlap, 142.2 x 116.8 cm, The Museum of Modern Art, New York, NY. Wikimedia Commons. 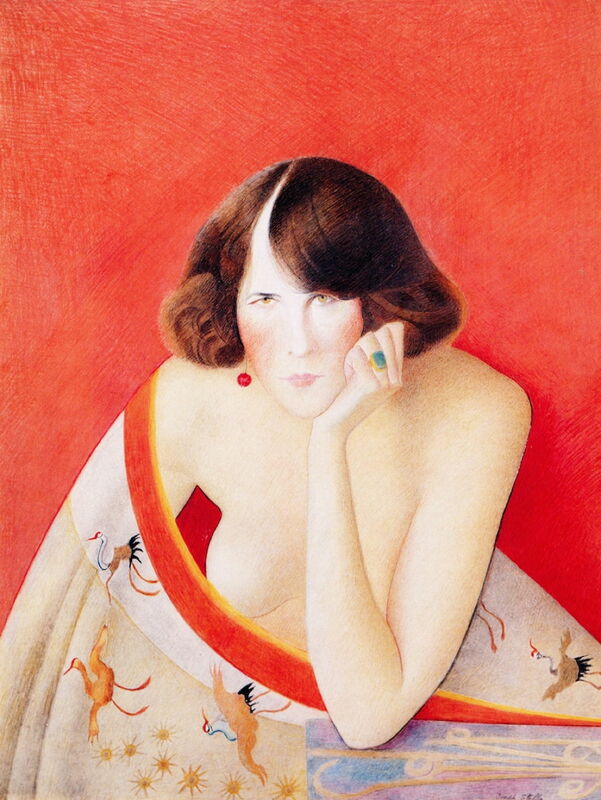 The most extraordinary feat of Stella’s work is the number of different styles which he used over any given period. 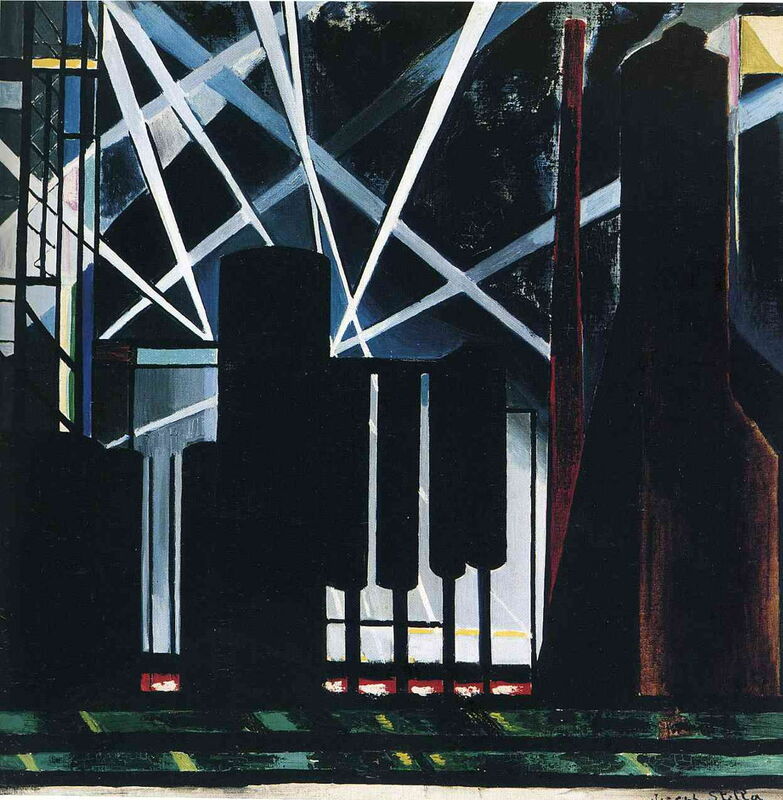 From his earlier industrial settings came the Precisionism of Factories in about 1920-21. In 1920-22, Stella completed a huge five-panel mural for the Newark Museum, titled New York Interpreted (The Voice of the City). Critics considered it to be the most successful attempt to show city life during the period between the wars. 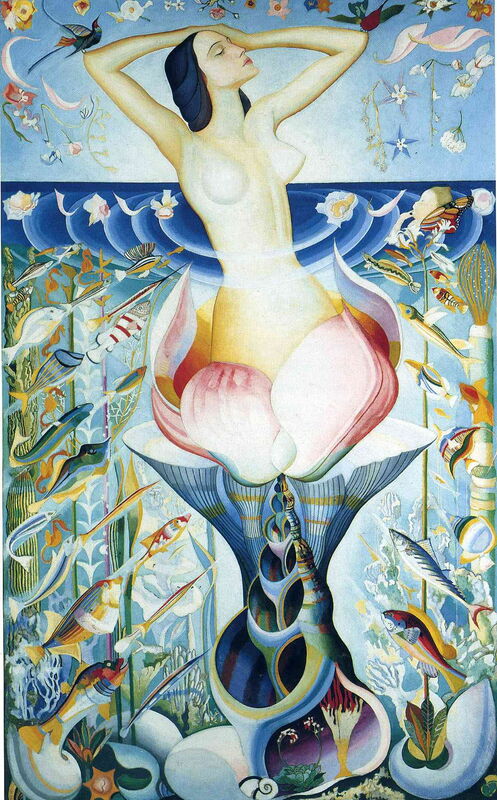 Joseph Stella (1877–1946), The Birth of Venus (1922), oil on canvas, 215.9 x 134.6 cm, Private collection. The Athenaeum. Next, in the early 1920s, he briefly painted mythical narratives, with The Birth of Venus (1922), shown above, and Leda and the Swan (1922), below. 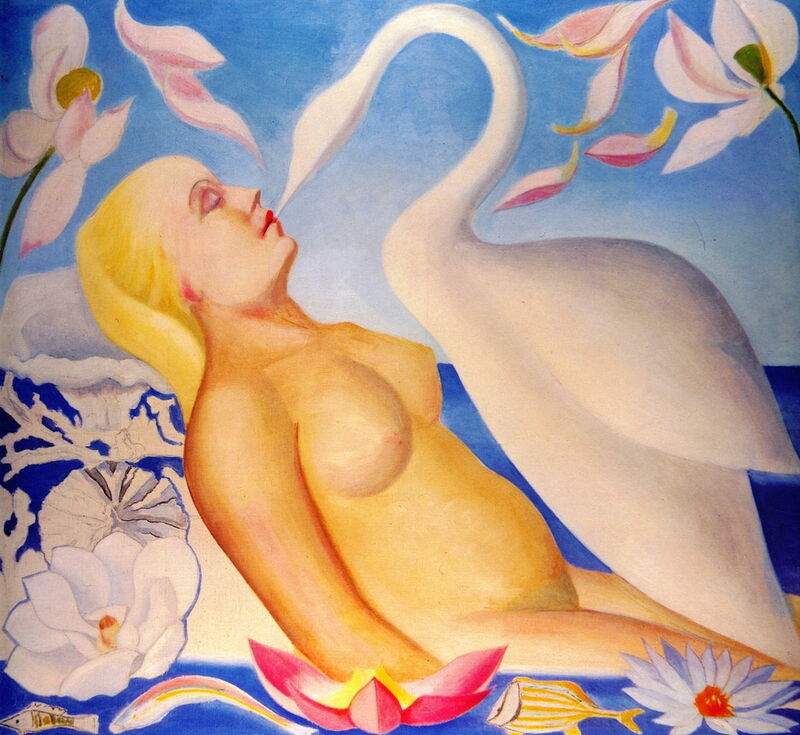 Joseph Stella (1877–1946), Leda and the Swan (1922), oil on copper, 108 x 118.1 cm, Private collection. The Athenaeum. Joseph Stella (1877–1946), The Virgin (1922), oil on canvas, 100.5 x 98.4 cm, Brooklyn Museum, New York, NY. Wikimedia Commons. 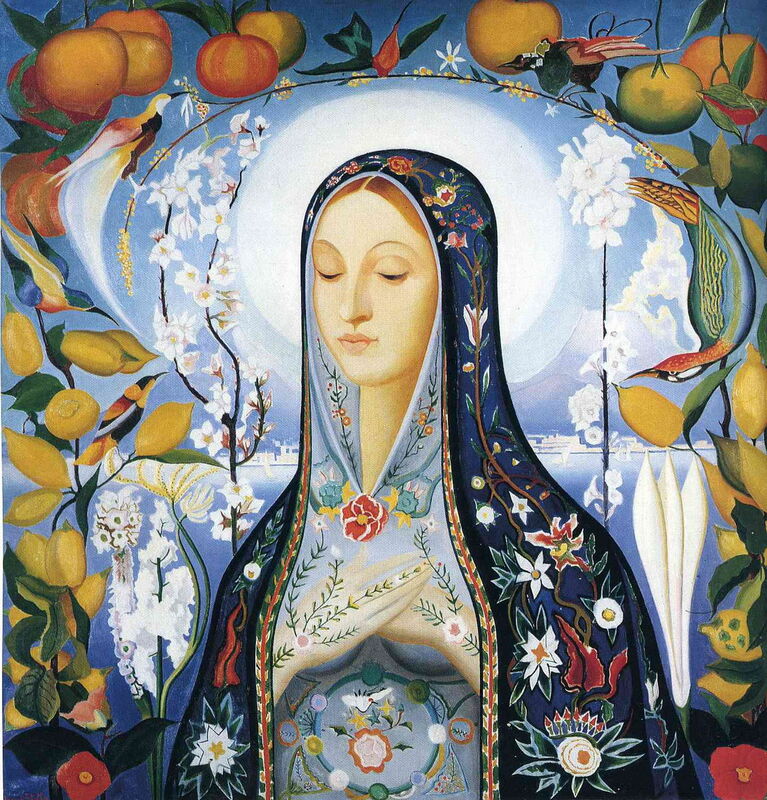 In The Virgin from 1922, Stella adopted a traditional religious motif, expressed in his near-Surrealist style with fantastic fruit, flowers and birds. Stella became a citizen of the USA in 1923, but quickly felt unsettled and homesick. He spent much of the next decade travelling in Europe, returning to America mainly to organise his work for exhibitions. Joseph Stella (1877–1946), Kathleen Millay (c 1923-24), crayon and metalpoint on paper, 71.1 x 55.9 cm, Cheekwood Museum of Art, Nashville, TN. The Athenaeum. As if these elaborately-detailed oil paintings weren’t enough, Stella developed a novel drawing technique combining metalpoint with crayons. he used it in this intimate portrait of Kathleen Millay from about 1923-24. His subject was a writer, the youngest sister of the poet Edna St Vincent Millay. Kathleen married Howard Irving Young, the famous screenwriter, and died in 1943. At the time of this portrait, she would have been about 27. Joseph Stella (1877–1946), By-Products Plants (c 1923-26), oil on canvas, 61 x 61 cm, The Art Institute of Chicago, Chicago, IL. The Athenaeum. Then, just when you might have thought that Stella was done with factories, smoke and Precisionism, in about 1923-26 he painted this view of By-Products Plants. Posted in General, Life, Painting and tagged Chase, Cubism, Futurism, Hartley, painting, Stella, Surrealism. Bookmark the permalink.